JK, Kamana Jethmalani, Srimukhi, Dr Girish Karnad, LB Sriram, Chikkanna, Chandrakala Mohan, Uday, Ramesh and others. 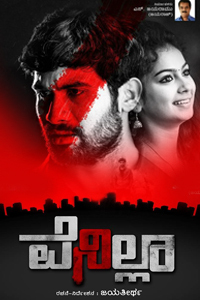 Title - Chandrika, Producer - V Asha, Direction - Yogish, Music - Gunavanth, Cinematography - K Rajendra Babu, Cast - JK, Kamana Jethmalani, Srimukhi, Dr Girish Karnad, LB Sriram, Chikkanna, Chandrakala Mohan, Uday, Ramesh and others. A ghost is also human. It will obey the instructions of an elderly person. The switch key is `emotion' in this `Chandrika' to set aside ghost effect. Ghost learns the safety of her uncle, it will study that her husband has not done any mistake. Quietly it walks away from the scene. In `Aptha Mithra' actress Soundarya was locked in a place by a mantrik with psychologist support. In the similar way `Chandrika' is not able to cross `Lakshman Rekhe' when her husband is beaten. The anger goes up and ghost `Chandrika' kills the two setting the husband free and knowing her paternal uncle is back to normalcy from amnesia quieten its force. A thorn should be removed from a thorn is the policy of debutant director Yogesh. In what fashion the marriage was broken - just a few seconds before tying of Mangalasutra in the past, the same situation is created so that the sick regains memory. With marriage scene again, Chandrika attacking on bride, Mantrik controlling the ghost effect - it is quick developments not wasting time from director Yogesh. Handsome hunk JK (Karthik Jayaram) has given a good performance compared to his previous film as hero in `Just Love'. The agile look, physical build and dialogue delivery of JK is on high scale in this film. JK is here to stay for long. Even in poised look JK is tolerable. Kamana Jethmalani and Srimukhi are a treat to watch. The innocence of Kamana is tremendous; the vigour in Srimukhi is well expressed. Dr Girish Karnad has nothing special. The technical team of this film worked very well. Three songs in the film are melodious and mixed with traditional style. Music director Gunavanth is promising. Cameraman Rajendra Babu and editing for this 110 minutes cinema is precise. Yogesh and team `Chandrika' is delectable in parts.